The geometric deco design of stylised shape and form replaced the the equally stylised but organically based geometrics of the Art Nouveau period. 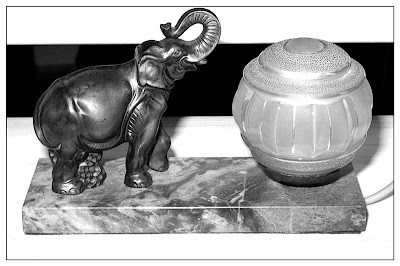 Initially a luxurious style using expensive materials such as ivory and jade, later artefacts benefited from the the introduction of Bakelite and plastic, which significantly reduced production costs. The style itself was named from the 1925 Paris Exposition Internationale des Arts Decoratifs et Industriels Modernes. 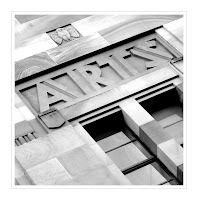 Art Deco developed rapidly and its influence is readily seen in period fashion, jewellery, sculpture, the graphic arts and of course architecture, (which provide the most enduring and commonly recognisable examples). The subject of this post is a French Art Deco table lamp (circa 1930), which contains a not atypical contradiction of simplistic and detailed forms, often found in lamps and glassware from the period. 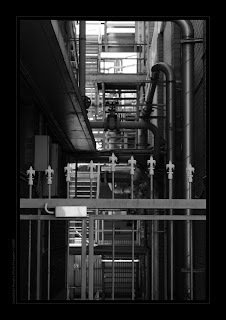 For my reading of Art Deco I wanted to capture a grittier, more industrial feel for the application of the style. 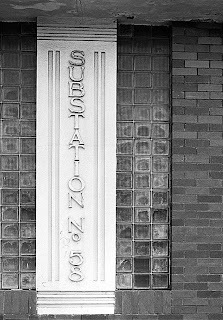 I knew of some buildings in South Brisbane that I thought might make reasonable subjects, and found Substation No.58. 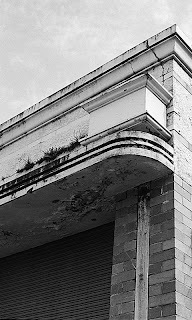 My preferred image of this subject captures some of the iconic shapes, but also shows that not everyone now keeps the Art Deco remnants in pristine condition. I particularly like the textures here, but also that the essence of the style are still recognisable through the grime and the decay. I am making no apologies for posting something in colour as the mint green interior of the Tattersalls Arcade has to remain intact to show it at its best. And since the overall scheme of this image is still monochromatic, I think my fellow bloggers will humour me! 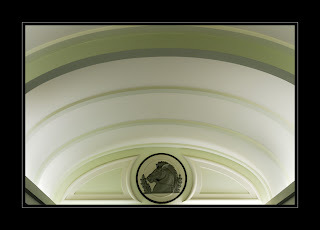 The Tattersalls is a marvellous blend of Neoclassical and Deco from the early 1920s. The medallions and friezes of the interior are set off by the sweeping curves and colour schemes. They embody a common theme in Art Deco where amidst all the clean lines one might find an isolated spot of ornamentation obviously influenced by Classical or even Rococo styles. 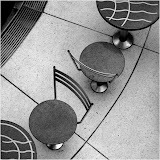 This is one of three photographs I have taken in support of Nicole's interest and probably the most appropriate to post first as it not only compliments the previous image theme wise, but also steers us back to Nicole's art deco focus. No prizes for guessing where this is. 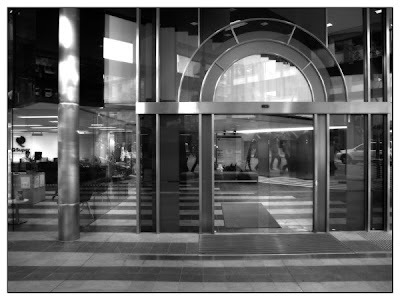 I must say I'm a little surprised that this door hasn't been nailed by Boyd in his wanderings. The title refers to the style I think it's trying to portray, although whether that's deliberate would require a query of the designers, whoever they may be. I took this image some time ago, in 2007 I think, when I was deliberately wandering the streets of Brisbane looking for subjects of the type taken by my colleagues. If it isn't obvious from the history of my posts, I am not a big fan of architectural photography, it is a highly specialised area which my friends are exceedingly good at but causes me no end of frustration. However with the recent "burst" of door posts, I thought I would submit this image. 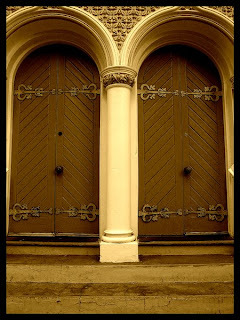 I quite like the Moorish curves and points over the doors. I could almost imagine a Crusader in battle armour, white tunic with red cross, standing with drawn sword on the steps. 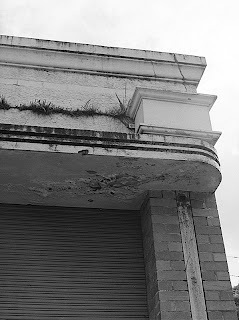 The Manor Aparments building on Queen Street is likely to be the first that springs to mind at the mention of Art Deco. This extrovert structure bursts with every kind of adornment and one day I hope to find a crane and capture the menagerie of weird and wonderful American style gargoyles. These few detail shots will have to do for the present. I am going to beg my fellow bloggers' indulgence on this particular topic. 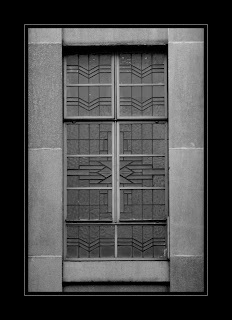 Art Deco is an era that fascinates me. The age of beautiful cars, fountain pens, home furnishings, and of course architecture. The western world was breaking away from the mould of recreating the past and pushing forward to something new. Punctuated by war and just between the flamboyance of Art Noveau and the depression of Utilitarinaism, the Jazz Age stands as a final fling at societal originality that permeated life in its entirety. My flagship in this exploration is the key example of Deco architecture in Brisbane, the University of Queensland. This is one of the most stunning neoclassical buildings in the CBD and I pass it nearly every day in the rush to work. 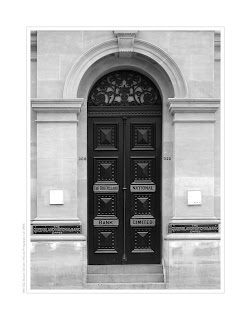 Boyd has captured gorgeous detail images of the severely styled door so my take on it is to step across the street and catch it in its frame. To answer the question, 'Does Nicole ever take a "messy" shot?' Here is my reply, 'Once in a blue moon'.